“So, what is Belize like?” asked our friends when my husband and I returned from our vacation there. We tried to imagine what they might want to know. The first impression we had of the Central American country as we flew in was one we anticipated. I peered out the window of our jet at long expanses of aqua water spotted with dark patches of underwater foliage and bits of islands. 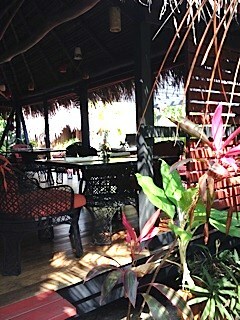 Tropically beautiful! We could see the many modest structures of the main city not far away. We landed beside a low building that was the international airport in Belize City and joined the rest of the passengers climbing down portable metal steps to tramp along the sidewalk to one of the doorways in the terminal. The outside air was very warm (about 83 degrees F), comfortably humid, and swirling with dust from the planes. More than one major airline serves the airport, coming to rest not far from the few commuter planes. We elected to visit during the dry season between January and April, avoiding hurricane season that is supposed to begin in April. We were told heavy rains are frequent between June and December. Inside the airport, we stepped into an unpretentious space characterized by stucco, wood, and glass. Whatever air conditioning the airport might have had, was not working enough for us to notice it; the doorways of the gates were wide open. After going through customs, we wandered into the main area of the terminal–a large room where separately marked doors indicated the gates leading to the waiting planes. The seating was reminiscent of an antique railway station with long wooden benches. Shops surrounded the main area, offering an array of t-shirts, souvenirs, duty-free items, and liquor. Belizean merchants all accept American money and the exchange rate is 2 Belizean to 1 American dollar, but sales people don’t give change in American money if they give change for American money at all. A single lunch counter had already sold much of its stock, so we bought squares of Belizean (Moho) chocolate blended with peanut butter. It was exquisite. My first impression was wonderful. 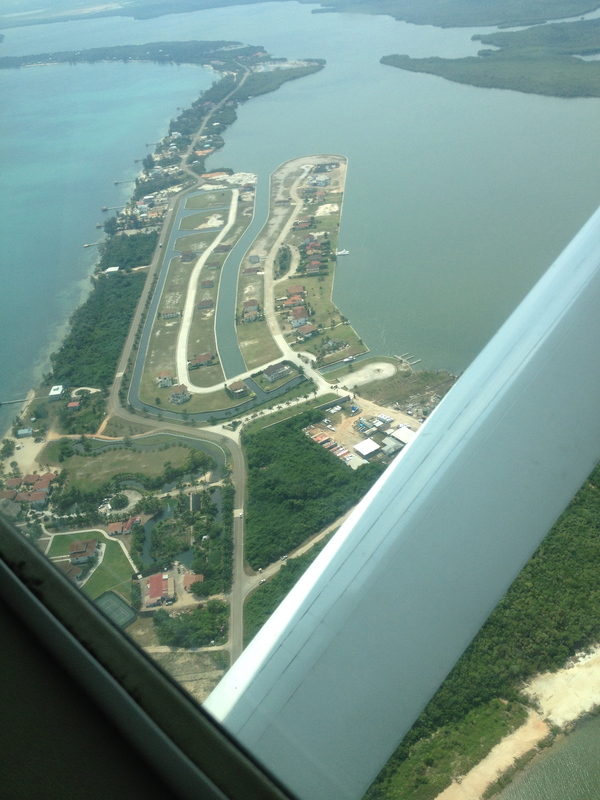 We had elected to spend our few days in the country in the southern portion along the beach of the Placencia Peninsula, so we had to wait for a commuter plane. We could have elected to rent a car (the rates were daily and expensive to us), pay for a special pick-up (even more expensive), or take the bus–which we were told could take as long as six hours for the three-hour drive because it made stops along the way. If we hadn’t traveled all night the night before, trying to make frugal connections for the two-hour flight from Miami, we might have opted for the bus. We really wanted to see as much of the country in our four days as possible. But we were tired, hungry (our stomachs didn’t appreciate the food we bought in the Miami airport), and ready to relax. Our plane ride was slated to take 40 minutes. 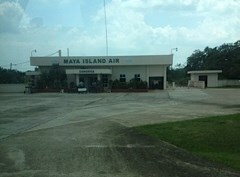 Commuter planes serve the most popular destinations in Belize daily from the airport in Belize City. 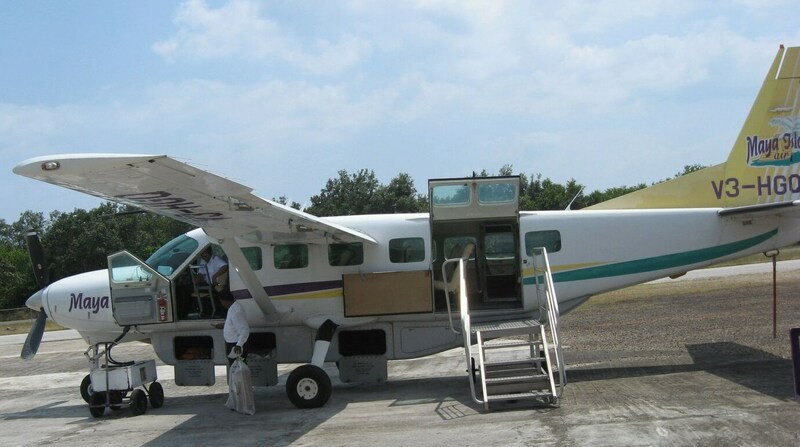 Our plane to Placencia was a Cessna Caravan nine-seater. It was our first indication that Belize doesn’t baby its guests. You’re expected to use common sense to care for yourself. The plane was already taking off before I had mastered the three-point seat belt. The small plane bouncing through the air was an adventure in itself–especially when it landed on the airstrip for the town of Dangria–an airstrip that could have been someone’s 2500 foot-long driveway. Deep underbrush rose beside the strip and just beyond the gravel turn-around lay the blue ocean. Our plane had to roll close to the terminal to allow another airplane space to take off, and then it had to perform a tight pivot in a circle at the extreme end of the runway to be able to rise into the wind. 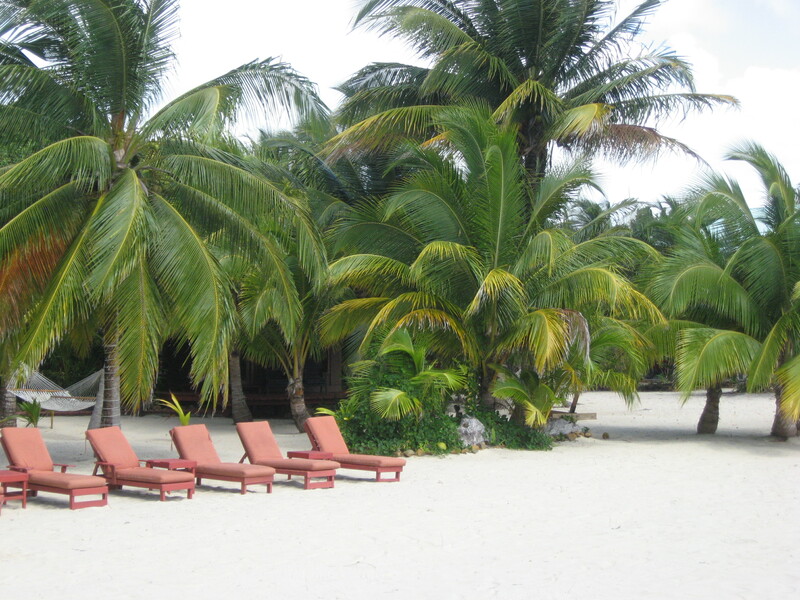 The most popular tourist destination in Belize is arguably Ambergris Caye (pronounced “key” as in the tail of Florida), an island in the north where festivals, locals selling their goods, and fabulous diving abound. The resorts there span many levels of luxury reached by golf carts. The island is used as a jumping-off point for guest divers who wish to visit the blue hole or the barrier reef. Other islands are less famous but are being quickly developed by outside interests. Belize City is less glamorous than the islands and, we were told, less attractive to tourists although it lies on the coast. It’s a gritty, natural city with all walks of life, including some late night crime theoretically restricted to those involved with illegal drugs. The interior of the country is famous for wildlife preserves, zip lining, and cave tubing. I’ve read that the landscape around the capital city of Belmopan is strikingly boring and flat. The western portion of the country near Guatemala is mountainous–much of it a reserve. On the Internet, we read about nonviolent robberies near the western border, but we didn’t meet anyone who had that experience. 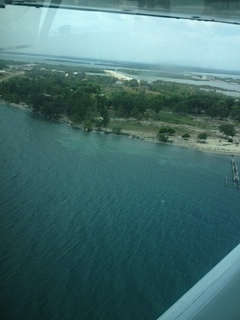 From the air, the peninsula of Placencia looks like a skinny ribbon of land between the ocean and a huge tropical lagoon. It bears a single racing stripe that is the road. A guy who was from a resort some distance from ours described the scenery for us as we passed over–most notably a large shrimp farm that is famous for its strict adherence to clean farming so that the shrimp are both tasty and untainted. We enjoyed many examples during our visit. A cab was waiting as we landed near Placencia Village at the tip of the peninsula, and the good-humored driver (an American expat) happily loaded our suitcases and us into his cab for the ride to our resort. He said he had left Belize at one point to return to Chicago, but decided to reverse his decision. He hasn’t considered leaving Belize since. 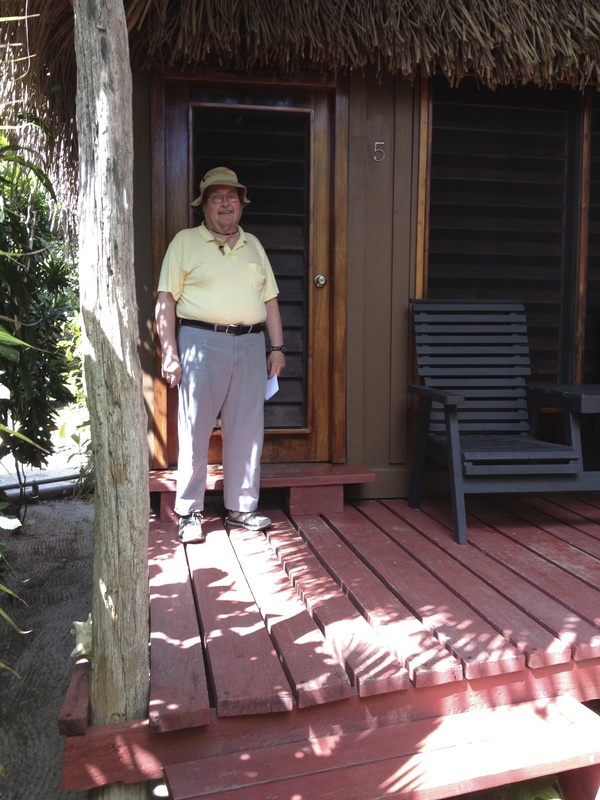 We passed a luxurious resort reportedly owned by Francis Ford Coppola on our way down the single paved road that runs the length of the peninsula. Our resort (The Singing Sands Inn) was billed as very romantic with only eight cabins and a lovely open-air restaurant facing the beach. It was as gorgeous as we expected from the photos on the Internet, although we had not anticipated the “friendliness” required by a line of cabins that felt like a luxurious summer camp. (Screened-in windows may block out bugs, but they don’t block out sound.) The fact that trucks stopped running up and down the highway at night was one for which we were grateful, and we were glad for the Wi-Fi available near the office. I could text our family back home from our room. 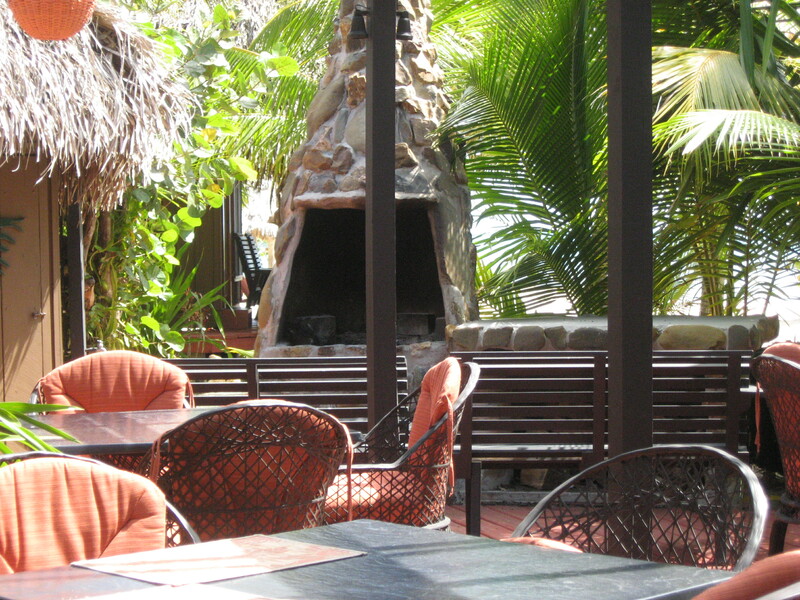 In the large, excellent restaurant/bar and on the wide expanse of soft sand beach, we had ample opportunities to meet and talk with other guests–who were almost all from our same U.S. state, as luck would have it. Happily, we enjoyed our neighbors and joined them for some of the tours and activities. In addition to tours, the resort was willing to rent kayaks and a two-seater paddle boat that could be used to reach a small island directly across from the resort. The other guests told us the island was a great spot for snorkeling and fishing. Our wonderful Mayan concierge arranged all our tours for us, including the taxis, with patience and attention to detail. He spoke with us, not at us, in a charming Mayan accent I call “Jamaican Lite.” He could speak Creole, Mayan, Spanish, and English. My husband and I didn’t always entirely understand what he meant, such as when he said we would have to get wet on our jungle tour. He meant we would have an opportunity to swim up a cave river to see a waterfall. We thought we were going to walk through a waterfall, so we didn’t bring our camera–which was a sad mistake on our part. We need to learn to ask more questions. 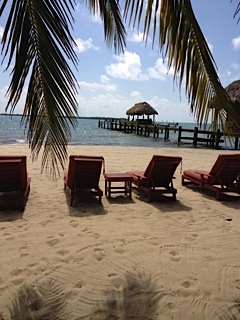 In Part Two of “Here’s Lookin’ at You, Belize,” I’ll share what my husband and I learned about the tours available around Placencia, Belizean food and specialties, real estate, and where to get the best darned rum punch I’ve ever had. Welcome aboard! Anyone who loves diving has to be okay in my book–especially near Belize where the ocean hides so much magic. I’m glad you took the time to comment, and I hope you’ll feel free to add more comments in the future. Maybe you can even give us some diving tips! This entry was posted on April 16, 2014 by Personal Journeys with Gramma in Travels and tagged Ambergris Caye, Aqua Water, Barrier Reef, Belize, Belize City, Blue Hole, British Honduras, Cave Tubing, Central America, Clean Farming, Commuter Plane, Creole, Diving, English, Festivals, Fishing, Kayaks, Mayan, Open-Air Resort, Paddle Boat, Placencia Peninsula, Placencia Village, Shrimp Farm, Snorkeling, Spanish, The Singing Sands Inn, Tours, Tropical Vacation, Wildlife Preserves, Zip Lining.